Another enthralling evening in Holmpatrick where the home team played fantastic rugby for 50 minutes and then Wanderers decided to play and nearly pulled off a huge comeback. The match started in perfect conditions in front of a large crowd and Skerries began very encouragingly. Rory Woods scored after a spell of continuity between backs and forwards and after 10 minutes following a great interplay between Michael Turvey, Ross Halligan and Ross McAuley, Kevin McGrath went over for five and converted by Paul Devitt. Skerries up by 12 to Wanderers 0. Skerries scored another try after 30 minutes again by Kevin McGrath and at this stage the home team were in complete control. Just before half time, Wanderers scored a well worked try leaving the score at 17-7 at the break. Skerries had dominated the half which the score line didn’t really reflect. It was really important that the home team got the first score in the second half playing with the wind to maintain the momentum. A try duly arrived shortly after the restart by Conn Marry and was ably converted by Paul Devitt. 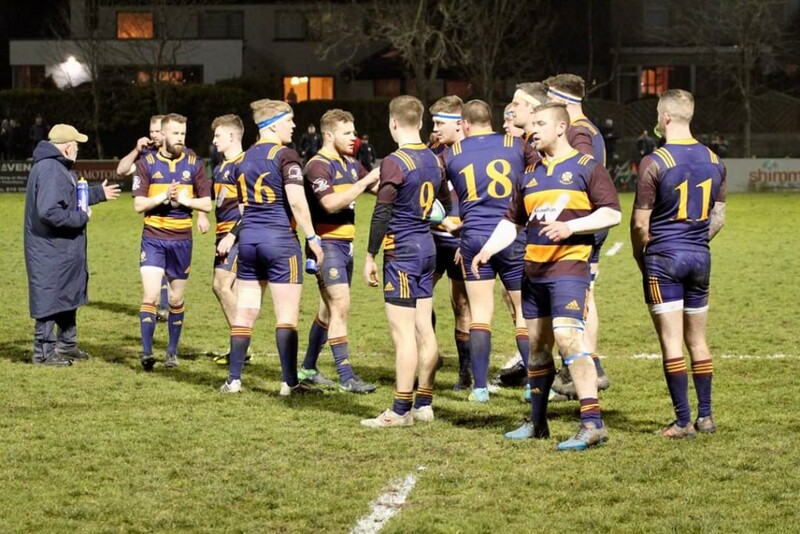 After 50 minutes Paul Devitt scored Skerries fifth try of the night and it appeared that the home team were going to win easily as they were now leading by 29-7. Wanderers had other ideas and threw caution to the wind and scored two tries in quick succession after constant pressure to bring the score to 29-19 with 10 minutes to play, Skerries were on the rack! At this stage Skerries needed a piece of inspiration to get them moving again and Tom Mulvany made a huge tackle and forced a penalty which relieved a lot of pressure. A poor kick in injury time gave Wanderers another opportunity and again after valiant defence, Wanderers scored and converted to get two bonus points. The sound of the final whistle was a huge relief to the players and supporters of the home team and a great five points to help the club climb up a congested table. The referee contributed greatly to a free flowing match and has to be congratulated on refereeing the offside line which seems to have disappeared in international rugby. On the night the Skerries lineout performed well with Tom Mulvany and Ben Jenkinson to the fore (Ben also managed to steal a few of the opposition throws). The scrum has improved week by week since the turn of the year and again was strong on the night. To name a man of the match would be difficult but Michael Turvey, Ben Jenkinson, Ross McAuley and Ross Halligan all put in huge shifts. In the backs, Rory Woods had a fine game and all the other backs looked dangerous with ball in hand. The substitutes also made a difference when introduced. Only two more matches left and our destiny is in our own hands. A difficult away match against league leaders MUBarnhall in two weeks followed by Dungannon at home after that. The team needs all our support for the next few weeks. Team , Cormac Marrey ,C Leonard ,T scuffil,R Halligan ,T Mulvaney , M Turvey ,B Jenkinson ,R McAuley ,R Woods ,P O’Loghlen ,M Sherlock © L Jones ,P Devitt. C Lennox. K McGrath , Conn Marrey ,E Sherlock ,j Sherwin ,R Jenkinson ,R Gordon .